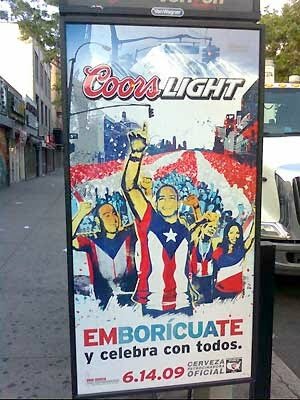 Coors Light advertisement in the Bronx has offended some in the Puerto Rican community. NEW YORK, NY -- Leave it to the sensitive folks at Coors to miss the mark on Latino marketing. A new ad campaign by Coors for the upcoming Puerto Rican Parade has ignited a controversy that has offended many Puerto Ricans living in the Yankee Stadium section of The Bronx. There is a new controversy being served up on the corner of Grand Concourse and East 161st. At a bus stop in the shadows of the Bronx Supreme Court, a Coors Light ad is brewing questions from the Puerto Rican community with its "Emborícuate" ads - Spanish for "become Puerto Rican." Coors Light is a sponsor of the Puerto Rican Day Parade, the inspiration for the message. The ads, however, show large bottles of beer with the "Emboricuate" message below, and the only mention of the parade in tiny print. "That is really wrong. I can't believe that they would allow that or even put that on there like that. That doesn't look right at all," says Eva De La Cruz. There are approximately three million Puerto Ricans in New York, and a handful that PIX11 spoke to - along with others from various backgrounds - were offended when they came across the ad. "I was looking at that sign and Boricua means a breed of people, I don't think that drinking represents our culture that way, I think that is not good advertisement," says David Madera. A few feet away from him, a Puerto Rican man sitting on the steps of the Courthouse drinking a Pepsi, who would only identify himself as Juan, added, "That is like saying that us Puerto Ricans, that, 'Hey we just get drunk!'. . . it's not like that you know."